This early stage biface is one of 11 bifaces (see McKinnis cache) discovered during a land leveling operation in St. Louis County, Missouri. It's an early stage biface that illustrates "classic" Clovis flake removal technique. Large percussion flakes have been removed from several different directions. It has been demonstrated that a rocker-punch technique or indirect style of flaking may be the way Clovis people were making these small and the very large platter biface cores. 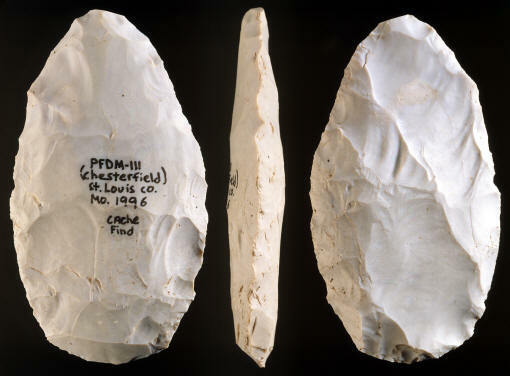 Clovis biface reduction was achieved by removing large edge-to-edge percussion flakes from sides, corners and ends. This is a lithic technology that was no longer in use in post-Clovis cultures. The intended purpose for this early stage preform was probably to make a fluted point. This biface is made of Burlington chert and measures 4 3/4 inches (12 cm) long, 2 5/8 inches (6.7 cm) wide and 3/4 inch (1.9 cm) thick. It's generally accepted that fluting is an American invention and the technology must have developed from a pre-Clovis people who were not fluting. One possible explanation for a paradigm shift towards a fluted point technology might have been the incentive to use a different flintknapping technique. This fundamental change might have developed from a desire to utilize large high quality cherts and chalcedony that became available in the New World for the production of very large biface cores. If, for instance, a knapper changed his technique from just using a billet and punch to a rocker punch technique (see Dothager), the difference in flake removal control might begin to produce a completely different type of projectile point. The indirect rocker punch technique allows the knapper to remove, with less effort, very large flakes across the face of very large bifaces and to remove the flakes from any side, end and corner angle. This edge-to-edge style of flaking does not appear as a tradition in post-Clovis cultures and it's a good bet that the technique probably won't appear in a very early pre-Clovis culture. In 1996 a cache of 11 bifaces and 12 core blades were discovered on land that was being leveled for houses. The site is located on a hill top and within 2 miles of the Missouri River in St. Louis County, Missouri. This cache was made with stone tool manufacturing technology that relates to the Clovis culture. The largest artifact in the cache is a basally thinned late stage Clovis point preform. A base of a Clovis point was also found near this cache. This picture shows three views of the original McKinnis cache biface.